✔ The panel is made of high glossy finished particle wood with superb paint process, use safe and comfortable, easy to clean. ✔ L-Shaped desk with bookshelf is very spacious, easy to place different office supplies, and provide spacious working space to you. ✔ Modern simple fashion, elegant appearance, steady frame design to ensure excellent stability. ✔ Come with a host tray to protect the computer host. 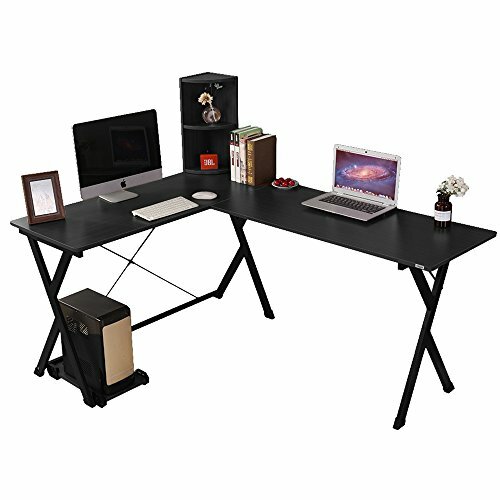 ✔ Easy to Assemble & Functional: All parts, tools and instructions are included, using it as computer desk, office desk, serving table or any other scenes you want. Tips: The customer need to assemble this table by yourself, that will take some time and effort, so if any problems please contact us, we will try our best to fix (The install tools come with the package). 【Dimensions】: 47.2+43.3L * 18.9W * 28.3H inch (120+110L * 48W * 73H cm); Total weights about 48.5 lbs (22 kg). 【High Quality Material】: The panel is made of particle wood with high glossy finish and very smooth, it is very safe and comfortable to use; This desk frame utilizes heavy-duty and powder-coated metal materials, which ensures stability and durability. 【Large Storage Space】: L-Shaped desk with bookshelf is very spacious, easy to place different office supplies. Completely solve the problem of storage and arrange to ensure enough desktop space. 【Humanity Science Design】: Modern simple fashion, steady X-frame design to ensure excellent stability; Fits all different indoor environment, especially the corner of the room. 【Applicable to Multiple Scenes】: Using it as computer desk, office desk, your workstation or any other scenes you want. This desk will fits all different indoor environment on your home or office.